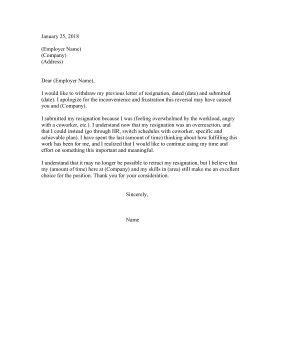 If you change your mind about resigning, use this sample retraction letter that withdraws the resignation and lists reasons you want to stay. I would like to withdraw my previous letter of resignation, dated (date) and submitted (date). I apologize for the inconvenience and frustration this reversal may have caused you and (Company). I submitted my resignation because I was (feeling overwhelmed by the workload, angry with a coworker, etc.). I understand now that my resignation was an overreaction, and that I could instead (go through HR, switch schedules with coworker, specific and achievable plan). I have spent the last (amount of time) thinking about how fulfilling this work has been for me, and I realized that I would like to continue using my time and effort on something this important and meaningful. I understand that it may no longer be possible to retract my resignation, but I believe that my (amount of time) here at (Company) and my skills in (area) still make me an excellent choice for the position. Thank you for your consideration.